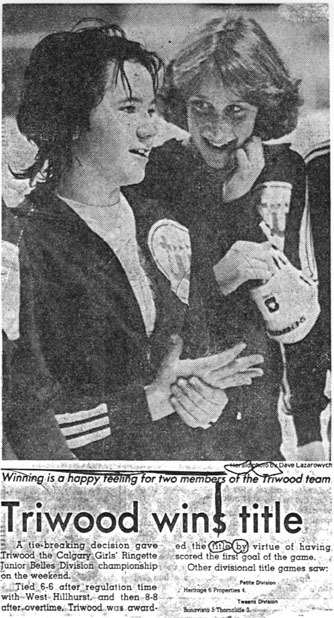 The second annual Calgary Ringette School, sponsored by the Calgary Booster Club was held August 5 – 9, 1980 at Norma Bush Arena. It was organized by Frances Willis and instructors included: Andy Jones, Claire Lukey, Gerry Zuk, Marlayne Boutin, and Leanne Henderson. On October 25, 1980 a referee clinic was held at West Hillhurst. On November 5, 1980 a coaches level 1 clinic was held at West Hillhurst. 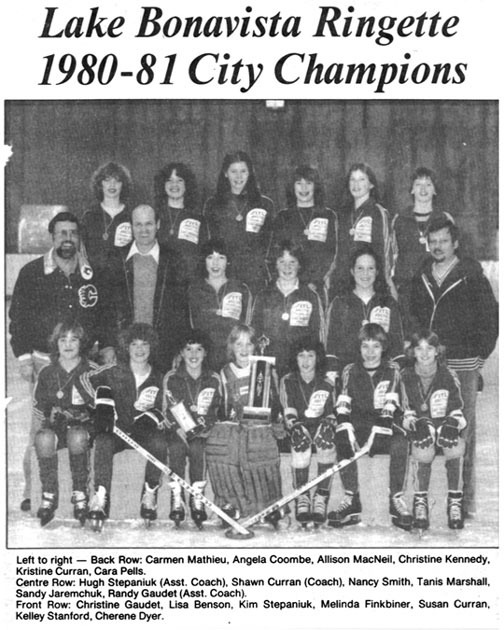 At the Junior Level, this team was "double-carded", meaning its' players were a combination of players who participated all season on a houseleague ("B") level team. They got together once a week, if possible, and practised as a "rep" team. At the Belle level, there were no houseleague teams to draw from, so this team was formed basically from anyone who was Belle age, and interested in playing on a rep team. These teams were referred to as "A" teams - there was no such thing as "AA"
Calgary's first Belle Rep Team experienced a short, but far from unsuccessful season. 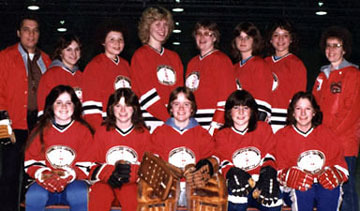 In January of 1981 these eleven girls got together, with the help of John Morcom and Don Henderson, and travelled to Lacombe to play two games. Considering these girls were introduced to each other in the dressing room, they made a good showing. They participated in the Leduc tournament, and lost the final by only one goal in the Spruce Grove Tournament. They also travelled to the Provincials, held in Lacombe, and although they lost out, it was an excellent experience as most of the girls had never been involved in Provincial Playdowns. Their final venture of the year was to the "Sherwood Park Select A Tournament", where they played top teams from across Western Canada. 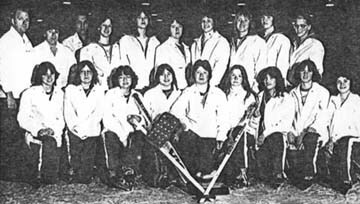 Back Row - Don Henderson (assistant coach), Brenda Holdaway (manager), John Morcom (coach), Jodi Heywood, Audrey Van Os, Laurie Moore, Jackie Willis, Teri Pielsticker, Mary Ellen Johnson, Shelley Anderson Front Row - Tonya Schimps, Tracy Robinson, Stephanie Stinson, Tina Holdaway, Darcy McNabb, Terry Crouse, Diana Young, Dawn Redmond, Wendy Cowe. Calgary's first Junior Belle Rep Team, sponsored by Kensington Dairy Queen (Mr. Jack Campbell), experienced a very competitive and successful year. They travelled to Port Coquitlam and mad an excellent showing. In their first game they suffered a close 5-4 loss to Port Coquitlam in overtime, then lost to Aldergrove. They then came back to beat Langley 8-7. After an exciting 8-7 loss to Langley in the final they returned to Calgary proud of their ventures. to help promote the sport.